Garagiste Events, producers of The Garagiste Festivals, today announced that the highly successful Garagiste Festival: Urban Exposure, returns to Los Angeles on July 11th, with 50+ artisan ‘garagiste’ winemakers pouring over 200 wines in a new, and appropriately rock and roll, venue: the stunning art deco masterpiece, The Wiltern. Garagiste Events also announced a first-time alliance with Artisanal LA that will see a mini pop-up of a sampling of their best artisan food producers offering tastes of their healthy, local, sustainable and delicious edibles. Proceeds from the non-profit festival will benefit the Cal Poly Wine and Viticulture program. Tickets now on sale at http://www.garagistefestival.com. The Garagiste Wine Festivals, which first exposed the American garagiste** movement, are among the most unique and influential wine events in the world and are the only wine events that exclusively showcase ultra-premium, cutting-edge, micro-production commercial wineries that produce fewer than 1,500 (and many under 800) cases a year. The Wiltern, which is considered one of the finest examples of Art Deco architecture in the United States, is located at Wilshire and Western, and is easily accessible by the Metro Purple Line train which stops at the Wilshire and Western station. This year’s festival features American garagiste movement winemakers from across California, including Santa Barbara, Santa Ynez and SLO counties, Napa and Sonoma counties, and Paso Robles, along with food producers from Artisanal LA. Artisanal LA showcases the best artisanal food vendors around the country, including many who aren’t yet accessible through retail stores or even through farmers’ markets. 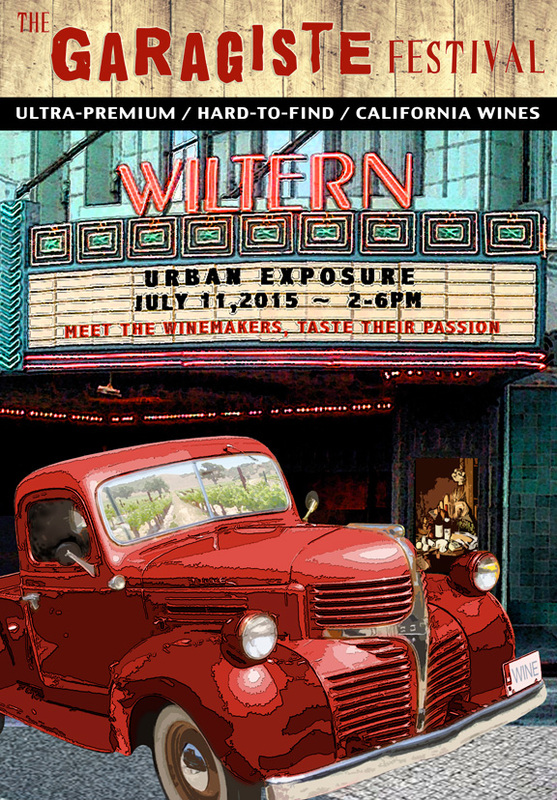 Through a special arrangement between the Garagiste Festival and Artisanal LA, some of these up-and-coming vendors, who share a passion for healthy, local, and sustainable ingredients, will sample their edibles at Urban Exposure. Among the over 50 winemakers already scheduled to pour are: Alma Sol Winery, Alta Colina, Apical Cellars, Archium Cellars, Ascension Cellars, Caliza, Cholame Vineyard, Cloak & Dagger Wines, Cordon Wines, Cutruzzola Vineyards, Dilecta Wines, Graef Wines, Imagine Wines, Kaleidos Winery, Kessler-Haak Vineyards, Levo Wines, MCV Wines, Pace Family Wines, The Central Coast Group Project, Two Shepherds Wines, Turiya Wines, Weatherborne, and Vinemark Cellars. **Garagistes (garage-east) is a term originally used in the Bordeaux region of France to denigrate renegade small-lot wine makers, sometimes working in their “garages” (anything considered not a chateau), who refused to follow the “rules,” and is now a full-fledged movement responsible for making some of the best wine in the world. The Garagiste Festivals were the first to shine a light on the American garagiste winemaker in 2011. Since then, the festival has helped thousands of consumers discover the remarkable wines of hundreds of true garagistes, who handcraft under 1,500 cases a year and pay close, hands-on attention to every wine they make. The Garagiste Wine Festivals (http://www.garagistefestival.com) are the first and only wine festivals dedicated to the undiscovered and under-recognized American artisan ‘garagiste’ producers who are making some of the best, most exciting, handcrafted small-lot production wines in the world. Founded by fellow garagistes Stewart McLennan and Douglas Minnick, the Garagiste Festivals are committed to discovering the best and most innovative limited-production winemakers and promoting and showcasing them to a broad audience of discerning wine consumers. In addition to its flagship annual festival in Paso Robles, CA, the Garagiste Festival line-up includes Garagiste Festival: Southern Exposure, featuring Santa Ynez Valley garagistes; the Garagiste Festival: Urban Exposure, in Los Angeles; garagiste mini-tastings presented from So Cal to Tahoe; winemaker dinners, a newsletter, garagiste profiles and more. The festivals were named one of the ‘Top Nine Incredible Epicurean Vacations’ in the world by ABC News,* “one of the premier wine events of the year,” by the LA Times and “Best Festival” by Sunset Magazine’s ‘Best of the West.’ The festivals are produced by Garagiste Events, a non-profit dedicated to furthering the education of future winemakers and those training for employment within the wine industry. Proceeds from the festivals are donated to the Cal Poly Wine and Viticulture Program.